Last March, Immigration and Customs Enforcement (ICE) conducted Operation Cross Check, the largest sweep in history netting a whopping total of 3,168 people. The operative was meant to identify, detain and deport the most serious criminal aliens. But, much like other enforcement-only operation and programs, the intended effect of deporting criminals is not occurring. Instead, over half of those arrested under Cross Check did not have any felony convictions. ICE has a fact sheet accounting for a dozen “Notable Arrests“ on their web page. These narratives point the essence of the operation. But one has to ask; what about the other 3,156 people who came under wide net of Cross Check? Chances are that over half of them are like Martin Berrospe Yepez who was detained and arrested in Rancho Cucamonga, California on route to a day laborer center to look for work. As the Coordinator for the Justice for Immigrants Coalition (JFIC), based in the Inland Empire, I’ve worked with Martin on a professional level on an array of events and projects. I’ve also gotten to know him at a personal level as well and become friends within the struggle for immigrant rights. I can attest to his honesty, hard work and commitment to his community. On the morning of Saturday, March 24, Martin was walking to a day labor site in Rancho Cucamonga, when ICE stopped him. Although ICE could not identify him, they asked him for his immigration status. Martin tells community leader, Emilio Amaya, that he attempted to speak English and explain that he was on his way to work but an officer told him that it was not necessary. After being questioned about his parent’s birthplace, the officer assumed that Martin was also from there. The officer stated that he would be deported in a few hours but Martin insisted that he belonged to an organized day laborer group and that he knew his rights. He insisted that he should have the right to see an immigration judge when he was offered voluntary departure at the ICE office in San Bernardino. The Inland Empire is no stranger to encounters with immigration agencies. In this video created by local community organizations in 2009, Border Patrol agents can be seen conducting raids and sweeps at day labor corners and centers in the area. Many caught under these sweeps or programs are far from dangerous. As detailed in ICE’s fact sheet, 1,257 of the 3,168 were either “Immigrant Fugitives” or “Illegal Re-entrants.” An immigration fugitive is someone who did not appear for their hearing or trial at an immigration court. An illegal re-entrant is a person who’d been given voluntary departure or deported and later returned without proper inspection. Neither of these categories poses a threat to the security of our local communities. Many of the re-entrants do so because their family and friends are here. Of the 2,834 labeled as “criminal aliens,” 1,357 were convicted for misdemeanors which can imply a conviction as minor as a traffic violation. Thus, nearly half had no violent criminal history and were yet caught up in the drag net of this operation. In the case of Martin, who has lived in California for almost 20 years, he has close ties to the community and is an active participant with the Fernando Pedraza Community Coalition. He has no criminal convictions and poses no threat the society. He was released on May 1 from the Mira Loma Detention Center after bail was met and his case is up for hearing in-mid-June. 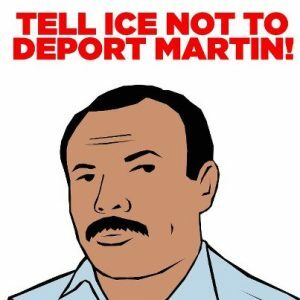 DreamActivist, an organizing group led by immigrant youth, has taken Martin’s case and created a call-to-action in order to have his case dismissed and halt his deportation. Martin’s case is one of few non-Dreamers that are being highlighted on the DreamActivist website. The show of solidarity with Martin as a day laborer, pinpoints to the cohesion of the immigrant rights community with people who strive for the America Dream via education and hard work.